Fire officials say a chemical reaction caused a small explosion in the NewsCorp building at 1211 Avenue of the Americas this morning. Over 700 people were evacuated and one person has been injured. The FDNY says the 10:39 a.m. explosion occurred on the 45th floor, which houses the heating and cooling systems and other utilities for the 47-story building. There are no offices on that floor, or on the three floors above. All three floors were evacuated. An FDNY spokesman said there was a reaction between two unknown chemicals that caused a slight explosion. Ha! I love "slight" explosions. 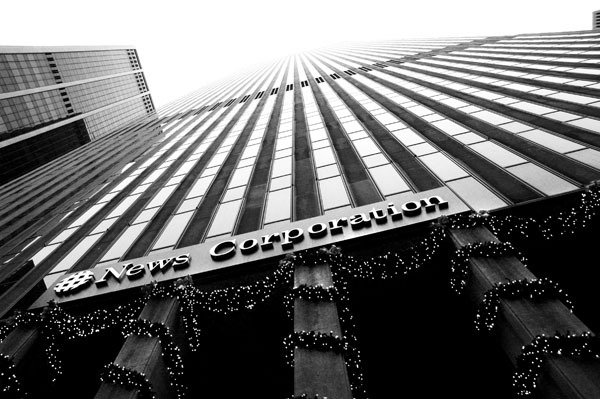 1211 Avenue of the Americas is NewsCorp HQ and houses Fox News (on the basement floors) and the New York Post (floors 9,10 and 15), which were all unaffected. AS PER FDNY, THERE IS APPROXIMATELY 30 GALLONS OF HAZARDOUS CHEMICALS THAT MAY HAVE NEGATIVELY REACTED. FDNY IS CURRENTLY CONDUCTING OPERATIONS IN LEVEL B HAZMAT PROTECTION SUITS. FDNY HAVE EVACUATED SEVERAL HUNDRED PEOPLE FROM THE 42ND TO THE 45TH FLOORS. THERE IS CURRENTLY ONE INJURY ON SCENE AND FDNY IS CONTINUING TO SEARCH ALL IMPACTED FLOORS. BUILDING IS PART OF THE ROCKEFELLER CENTER COMPLEX. Right now the FDNY and the NYPD need your help with these riddles: What is 21 out of 42? and What has four legs and is always ready to travel?